Just came across this link to an old Frank Capra film clip (The Unchained Goddess). It’s from 1958 and describes what we now know as climate change science, warning that “even now, man may be unwittingly changing the world’s climate through the waste products of his civilization.” In less than a minute and a half it covers the dangers of carbon dioxide emissions from factories and automobiles, rising earth temperatures, the eventual melting of the polar ice caps, resulting sea level rise, and changing weather patterns. 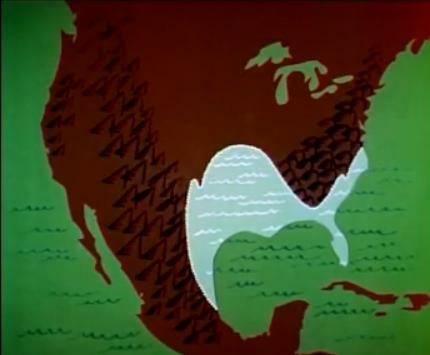 Capra produced this prescient warning two decades before the National Academy of Sciences reported that the doubling of carbon dioxide would cause a significant rise in global temperatures and over four decades before New York’s Sea Level Rise Task Force (last week) projected a 55″ rise in sea level by the end of the century. The problem of climate change, in particular, is something we should really start fighting. We only need to have a look at the data regarding the temperatures of the last few years to understand how climate has changed: the hottest years in the second half of the 20th century occurred in the Nineties, and a number of meteorological events have become really extreme. According to scientist Thomas R. Karl, these changes might also have been caused by human behavior, and we really should try to do something concrete to solve these problems, at least in part.